Topics: Children, Activities, Bible Study, Christian Life, Church Supplies, and Contemporary Life. Its 4 DNS Records include, dns04.prostores.com, dns01.prostores.com, and dns02.prostores.com. Clearblue Technologies (Massachusetts, Andover) is the location of the Apache server. 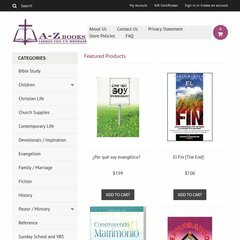 A-zbooks.net's IP address is 207.211.91.31.